In War by Other Means, Robert Blackwill and Jennifer Harris show that geoeconomic warfare requires a new vision of U.S. statecraft. "Despite having the most powerful economy on earth, the United States too often reaches for the gun instead of the purse," contend Council on Foreign Relations (CFR) Senior Fellows Robert D. Blackwill and Jennifer M. Harris in a new book, War by Other Means: Geoeconomics and Statecraft. Instead, argue Blackwill and Harris, the United States must strategically integrate economic and financial instruments into its foreign policy—what they define as geoeconomics—or risk losing ground as a world power. "Russia, China, and others now routinely look to geoeconomic means, often as a first resort, and often to undermine American power and influence," the authors observe. China for example, curtails the import of Japanese cars to signal its disapproval of Japan's security policies, while Russia periodically suspends gas supplies to Europe. "The global geoeconomic playing field is now sharply tilting against the United States," write Blackwill and Harris, "and unless this is corrected, the price in blood and treasure for the United States will only grow." Drawing on their combined foreign policy experience in both Republican and Democratic administrations, Blackwill and Harris urge the United States to give geoeconomic endeavors with allies and partners the same attention given to security cooperation. In a detailed set of policy prescriptions, they recommend that the United States use its position as an "energy superpower" to help allies like Poland and Ukraine, and to secure the Trans-Pacific Partnership (TPP) and Transatlantic Trade and Investment Partnership (TTIP) trade deals to help balance Chinese and Russian geoeconomic policies. Blackwill was formerly deputy assistant to the president, deputy national security advisor for strategic planning, and presidential envoy to Iraq under President George W. Bush, as well as U.S. ambassador to India from 2001 to 2003. Harris was a member of the Policy Planning Staff at the U.S. Department of State in the Obama administration and was a lead architect of Secretary of State Hillary Clinton's economic statecraft agenda. Educators: Access Teaching Notes for War by Other Means. An urgent message that other countries are using economic measures to achieve their geopolitical objectives. Absent an effective U.S. response, we will increasingly be required to rely on military force to protect our vital interests. Robert Blackwill and Jennifer Harris do policymakers a service by reminding them of the importance of geoeconomic tools. In a world increasingly affected by economic power, their analysis deserves careful consideration. A brilliant, comprehensive study of how economic measures have been—and should be—used to pursue geopolitical objectives. War by Other Means should be required reading for all presidential candidates and their foreign policy advisors. The economic aspect of foreign policy will be crucial to the next president's success. She or he will need to reckon with Blackwill and Harris's powerful arguments. 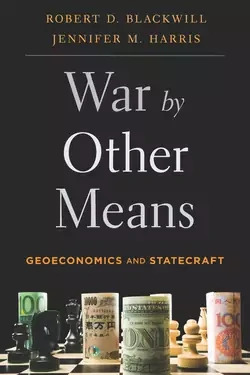 In War by Other Means, Robert Blackwill and Jennifer Harris build a very persuasive case for why the United States should make much more vigorous use of its economic and financial muscle to advance its geopolitical interests. This book should be required reading for anyone involved in making foreign policy. The two policymaker-scholars have crafted a readable and lucid primer. War by Other Means is [Blackwill and Harris's] blueprint for how the United States national security apparatus can better wield the economic tools at its disposal. It is, in military parlance, about putting the big 'E' in the DIME (Diplomatic, Informational, Military, Economic) equation back into balance with the other ways in which a great power projects power. Confident about the American mission in the world, the book is a lesson about how creative thinking can promote our interests without risk to blood and treasure. In the past 30 years, Blackwill and Harris argue the U.S. has largely stopped using geoeconomics, preferring military force instead. . . . It's a particularly critical time to change that approach, they say, as markets become more global and countries are reconsidering which economic tie is more important to them: the U.S. or China? These ideas aren't Republican or Democrat, the authors argue. Blackwill and Harris remind us that economic incentives and coercion are powerful instruments in achieving the vital national interests of leading powers. This book raises important questions.